Mary-Kate plans a suprise party for her best friend Amanda on the same night Ashley plans a suprise party for her best friend Jennifer. 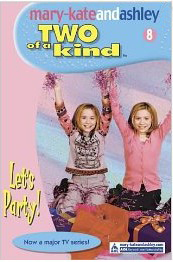 Even though Mary-Kate and Ashley are twin sisters, they have totally different personalities so major arguments arise, not only with each other but with their best friends. I'd have to say this is the best book in the whole series that I've read so far because these kinds of problems are what everyday kids would probably have.